In karate, there are numerous styles. The Wadoryu-Karate (literally, Way of Peace School), the Karate Club of Shuzo Imai is taught in our, is one of the four major styles of karate, which are taught in Europe. In Germany, the years in the 60 Wadoryu Teruo Kono introduced to and taught for many years. 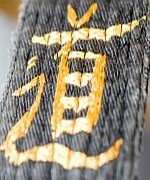 A key principle in Wadō-ryū is that of tai sabaki (often incorrectly referred to as 'evasion'). The Japanese term can be translated as "body-management," and refers to body manipulation so as to move the defender as well as the attacker out of harm's way. The way to achieve this is to 'move along' rather than to 'move against'—or harmony rather than physical strength. Modern karate competition tends to transform Wadō-ryū away from its roots towards a new generic karate that appeals more to the demands of both spectators and competitors. In our Wado-Ryu Karate Club Duesseldorf, we are fortunate with Shuzo Imai, one of the best and highest graded karate teacher and the student from Teruo Kono, as a coach to have.